Heat Transfer, Combustion, and Energy Systems: Internal combustion engines, physics and chemistry of spray combustion, pollution formation and mitigation, sustainable fuels, optical diagnostics, and computational fluid dynamics. Dr. Genzale began at Georgia Tech in December 2010. Prior to arriving at Georgia Tech, she was a post-doctoral researcher at Sandia National Laboratories’ Combustion Research Facility in Livermore, California. There, she applied laser-based measurements in combusting fuel sprays to study the mechanisms of pollutant formation and combustion inefficiencies that occur in direct-injection diesel and gasoline engines. During her graduate work at the University of Wisconsin – Madison, she worked on the development of computer models and optimization tools to explore new high-efficiency low-pollution engine designs. 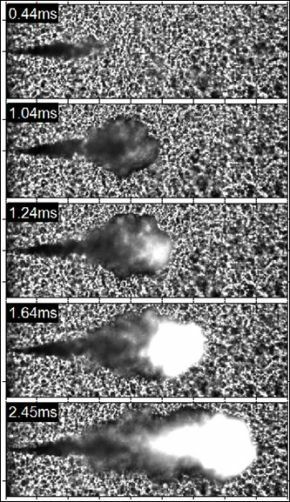 Time evolution of diesel spray ignition and soot formation (bright white cloud at head of jet) imaged with a high-speed camera. Dr. Genzale’s research is targeted at the discovery of fundamental fuel injection and combustion physics to enable high-efficiency clean-combustion engines. Research within Dr. Genzale’s group at the Spray Physics and Engine Research (SPhERe) Lab is conducted in a unique tightly-coupled experimental and model-based approach. The objective of this approach is to accelerate the discovery of unknown spray and combustion physics and enable advanced computational tools capable of optimizing engines for breakthrough-level low-emissions high-efficiency performance. Advanced laser-diagnostic techniques are used to probe multi-phase flow and chemistry in simulated direct-injection engine environments, yielding spatial and temporal measurements of pollution formation and sources of combustion inefficiency. Complementary modeling projects focus on the development of improved computational fluid-dynamic (CFD) models based on these measurements. Once validated, such models are used to explore new engine solutions beyond the scope of a laboratory setting. For example, the potential advantages of novel fuel-injector designs yet to be manufactured can be investigated. CFD models are also used to provide a deeper level of analysis to experimental results. Experimental projects currently center on the measurement of fundamental fuel spray physics and combustion for modern direct-injection engines. One focus area is to develop spatially and temporally resolved laser-based measurements of key fuel and combustion species at engine-relevant conditions for the validation of computational models. Another key area of interest is to address the potential benefits and challenges of implementing alternative hydrocarbon and biomass-based fuels in engines by probing the fundamental mixing and combustion behavior of these fuels. In addition, projects will exploit our improved fundamental understanding to investigate new methods for the control of pollutant emissions formation with conventional and alternative fuels. Computational projects are currently focused on the development of improved spray modeling approaches for engine CFD simulations. A key focus area is to reduce empirical uncertainties in current spray models to improve the predictive capability of engine CFD models. Another key focus area is to link the behavior of cavitating turbulent flows inside gasoline and diesel fuel injectors, which are largely inaccessible to experimental measurements, to atomization and spray characteristics outside of the injector nozzle – a significant unsolved topic that dictates air-fuel mixing and subsequent combustion behavior in direct-injection engines. Students working with Dr. Genzale can expect to work actively with automotive, heavy-duty, and other engine-manufacturing industries on projects that intersect fundamental physics and applied engineering. Students will participate in a highly collaborative research environment marrying leading-edge experimental and computational techniques. These projects will provide a unique educational and research experience for students with multi-disciplinary interests; crossing into areas of fluid mechanics, thermodynamics, heat transfer, combustion chemistry, quantum physics, optics, and computer programming. Excellence in technical writing and communication is also fostered and encouraged. L. M. Pickett, C. L. Genzale, G. Bruneaux, L. -M. Malbec, L. Hermant and C. Christiansen. 2010. Comparison of Diesel Spray Combustion in Different High-Temperature, High-Pressure Facilities. SAE International Journal of Engines 3:156-181. C. L. Genzale, S.-H. Kook, and L. M. Pickett. 2010. Liquid Penetration of Diesel and Biodiesel Sprays at Late-Cycle Post-Injection Conditions. SAE paper 2010-01-0610. SAE International Journal of Engines, 3:479-495. C. L. Genzale, M. P. B. Musculus, and R. D. Reitz. 2009. Optical Diagnostics and Multi-Dimensional Modeling of Spray Targeting Effects in Late-Injection Low-Temperature Diesel Combustion. SAE International Journal of Engines 2 (2), 150-172. C. L. Genzale, R. D. Reitz, and M, P. B. Musculus. 2009. Effects of Piston Bowl Geometry on Mixture Development and Late-Injection Low-Temperature Combustion in a Heavy-Duty Diesel Engine. SAE International Journal of Engines, 1, (1), 913-937. C. L. Genzale, D. D. Wickman, and R, D, Reitz. 2007. A Computational Investigation into the Effects of Spray Targeting, Bowl Geometry and Swirl Ratio for Low-Temperature Combustion in a Heavy-Duty Diesel Engine. SAE paper 2007-01-0119, SAE Transactions: Journal of Engines 116 (3), 88-102.